Hey everyone! It's another fact filled blog post today, which I'll break into 3 sections for ease. Meaning that you can just skip to the bits that you're most interested in, especially the amazing recipe for Hibiscus Poached Berries with Vegan Cashew Cream. Sound good? 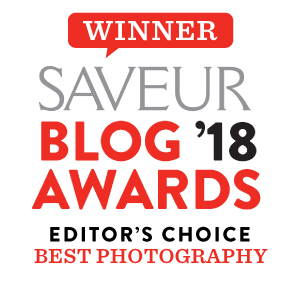 Great, so in today's blog post I'll be talking a little more about some key food photography lessons I learned during my #InFranceWeCook workshop. You can find the corresponding blog post and all the photos taken during the workshop here AND you can also see a little behind-the-scenes video at the very bottom of this blog post :). Secondly, I'm over the moon to tell you that I'll be co-hosting a food photography, yoga and creative gathering event in North Devon with Aimee from Twigg Studios and Carole from Mademoiselle Poirot. If you're interested to learn more and wish to join us then do read on ;). STEP OUT OF YOUR COMFORT ZONE – I think it's very easy to get stuck in a rut and always photograph food in 'your style'. If you're at the very beginning of your food photography journey, then perhaps that's not a bad thing; finding your voice is key. But if you've been a food blogger for a little while and are comfortable creating a particular 'look', then maybe this lesson is for you! Be brave, try something new – that could mean working with a different material as your backdrop to see how this affects the feel of your photos. 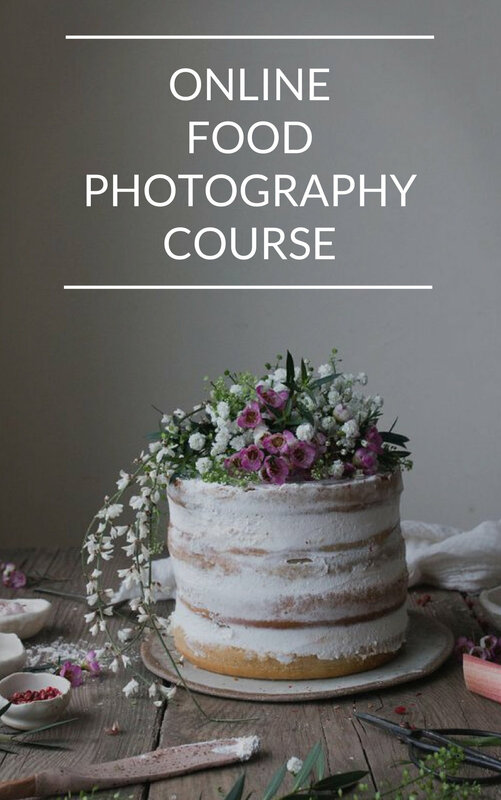 It might mean, photographing savoury food, if you're used to taking shots of cakes only. Or it can also involve working with darker tones if you're into light and fresh (or vica versa). Either way, it is only by challenging yourself that you can really develop your skills and take your photography to the next level. WORK ON YOUR OUTDOOR PHOTOGRAPHY – If – like me – you are used to taking pictures indoors with controlled light sources and carefully chosen backdrops, then this might be the next step for you. I find outdoor photography REALLY hard because you have much less control over key elements of the photography process. But, perhaps it is just that, which makes outdoor photography so exciting. I for one, really enjoyed working with completely different camera setting to what I'm used to in order to ensure the pictures still had depth and weren't over exposed. So next time you have a picnic, have a play with your camera and let me know how you got on :). COLLABORATE – Admittedly, this isn't a brand new lesson I learned during my trip to France, but the workshop certainly reaffirmed the importance of it to me. You see, I just strongly believe that as food bloggers and food photographers we have so many skills to share with one another that go far beyond anything practice on your own or text books can teach you. Therefore, I urge you to get in touch with food bloggers in your area. Host your own get together, cook, style and photograph together. If you do it with an open heart, only beautiful things can come out of it ;). For more thoughts on food photography and to read part 1-3 of this series, please just click here. Please join us from the 24th - 27th of March, 2017 for a 3-day food and photography retreat in a 19th century manour house in North Devon. We will be spending three days at Amberstone Manor is a stunning 19th century country house set in 5 acres of landscaped gardens and 20 acres of river meadows in the heart of Devon between Exmoor and Dartmoor. During the weekend we will work together to discuss camera settings and working with natural light. The first night we will have a vegan meal prepared for by yours truely ;). There will be a cake decorating class using natural ingredients such as fruits and edible flowers led by Aimee, followed by a styling workshop where we will use the decorated cakes and talk about props and placement. In addition, you will have the option of taking part in a yoga class, swim in the heated outdoor pool or lounge in the sauna. On the last night we will have a 3 course banquet meal cooked for us by a private chef. Prices start at £995 for a shared room and there is an early bird discount available for those of you who book by the 1st of October. Prices include accommodation, all meals, workshops, yoga class and a goodie bag to take home. For more information, please do not hesitate to e-mail me at kimberly(at)thelittleplantation(dot)co(dot)uk. I'd be happy to send you the schedule as well as provide you with any further details you might need. I look forward to hearing from you :). After months of back and forth and a few quick get togethers, Carole from the GORGEOUS blog Mademoiselle Poirot and I finally met up to cook and style a blog post together. The photography session took place at her STUNNING South London home, filled with the most precious food photography props EVER. I felt so lucky and couldn't help but take a few pictures of her lovely plates, cups and pots. Carole's photography style is rather different to mine as is the way she uses light and sets up her shoot. It was magical watching her work. Hence, I hope you enjoy these pictures (which have a very diffrent feel than my usual shots) and most importantly I hope you like the recipe. We got a thumbs up from her teenage son, so I feel very confident when I say THIS RECIPE ROCKED! Please place the cashews in clean, still water and soak them for 2-4 hours, or better still, overnight. The next day, please drain the cashews, then place them along with the maple syrup, lime juice, vanilla and filtered water in a blender. Blend until smooth and cream-like. I used my vitamix for this, but any blender or food processor will do. Fill a medium sized pan with the water, hibiscus and sugar. Over a medium heat simmer and reduce for about 10 – 15 minutes, stirring ocassionally and taste the forming syrup as you go along. Once done, give the berries a quick wash, remove any stems from the strawberries and place the fruit in a large bowl. Next pour the warm hibiscus syrup over the berries and allow them to poach for a few minutes. Whilst still warm, serve the berries with the cashew cream and enjoy!